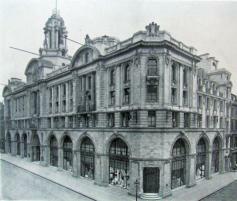 Contempory view of the Debenhams building, Wigmore Street. 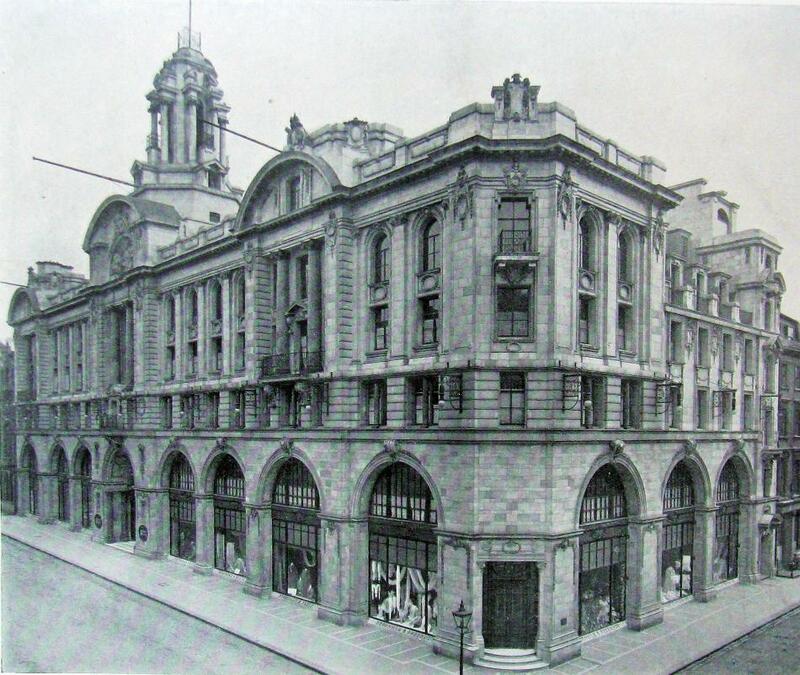 Walking along Wigmore Street, the most distinctive building, occupying almost a whole block frontage from the corner of Wimpole Street, with a raised central tower higher than other buildings on the street, is the former Debenhams building. It has no connection with today's Department store chain of the same name. The building is completely clad in white Carrara tiles by Doulton, which have lived up to their manufacturer's boast of being resistant to time and London pollution. 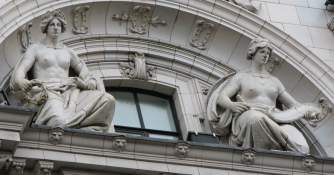 The building is in an Edwardian Baroque style, with touches of art nouveau, and dates from 1906-7, the work of the architects William Wallace and James Gibson. The central entrance, beneath the tower, is flanked by three bays on each side, and an extra bay to the Wimpole Street side. Arched windows, pillars and festooned wreaths abound, giving an impression of grandness and opulence. 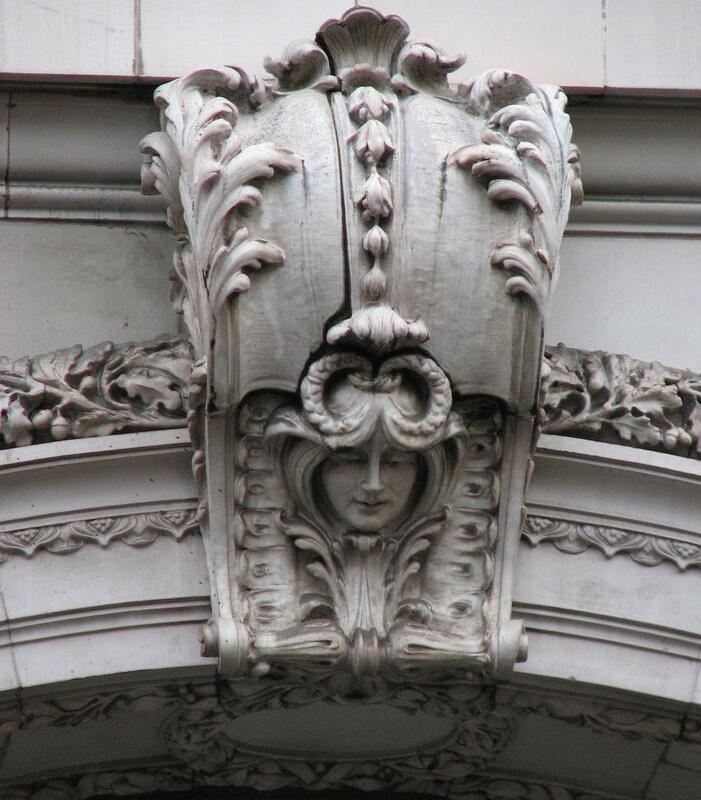 We notice the building on these pages because of the sculptural work which is part of the Carara decoration, hence by Doulton's, though as generally with terra cotta or ceramic work, there is no hint as to the sculptor. The sculptoral decoration is mainly on the central bay above the grand entrance and upwards to the tower. At second floor level, supporting a balcony, is a pair of winged cherubs, supporting a shield and olive and acanthus-wreathed garlands. Three storeys up, to left and right are nice female heads, two on the structure of the portico within shieldlike designs, and parallel to these, keystone heads on alternating tall windows. Charming things with art nouveau hair and leafy surrounds. The two central figures, in Doulton Carrara ware. Higher still in the centre, a pair of full figures, herculaean women with incongruously mighty shoulders and muscular torsos, in something of the spirit if certainly not the style of Albert Hodge. The heads are a simplified Greek Victorian, and excellent of their type. Above this, a royal shield with flanking lion and unicorn, and more little heads higher up on the tower. Only to be seen from an angle, to the left and right a little higher than the shield, are pairs of children standing with above each pair, a crown. All rather good. We may remark that the interior was once of great splendour, with bronze and enamel railings and other work by the Birmingham Guild of Handicrafts, plasterwork by the sometime sculptor Gilbert Seale, mosaicwork, and much marble, notably on the grand staircase. I am not aware if any of this survives. 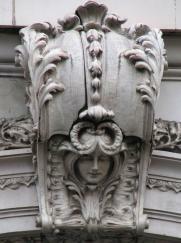 One of the art nouveau heads.